Chang Cheh‘s bittersweet ode to American film noir stars baby-faced muse David Chiang as the Opera partner and brother of Ti Lung, who is blinded and bloodied and kicked to bits after slapping a rival master. Chiang launches a scathing attack against all involved, finding time to shack up with his sister-in-law on a quest which takes him straight into the lair of the Generalissimo himself. 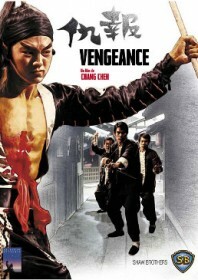 This film set the standard for the kung fu revenge film, cementing Chang Cheh’s importance as not only a great conductor of high concept extravagance, but also Hollywood-esque style and tenderness, balanced adequately with buckets of the red stuff. It’s visceral and heated even by today’s standards, which is why this Shaw film is so revered by cult film fans around the world. Although Vengeance may lack the depth of his more epic productions, it is still wired up like some kind of violent jack-in-the-box and highly entertaining.